When you look for a ﻿﻿﻿j﻿uice﻿﻿r in order to make your daily life easier the Black and Decker 400 watt JE2200B can be your perfect companion because of its beginner level easy controlling feature. This fruit & vegetable juice extractor is made by keeping the line “Simply Better” in mind. This machine is very easy to use at all and even a beginner can operate this juicer effectively and easily. And as the machine comes along with some great features it’s considered as one of the best fruit & vegetable extractors. Let’s find about more about this product in this in-depth review of Black and Decker JE2200B juicer. The Black and Decker JE2200B is simply a pretty good fruit and vegetable juice extractor. This unit comes with an affordable price and great for everyone. Let’s check out the features, good sides and bad sides of this juice extractor. The Black and Decker JE2200B comes with easy operation feature so that all kinds of people can use the juicer effectively even a starter. 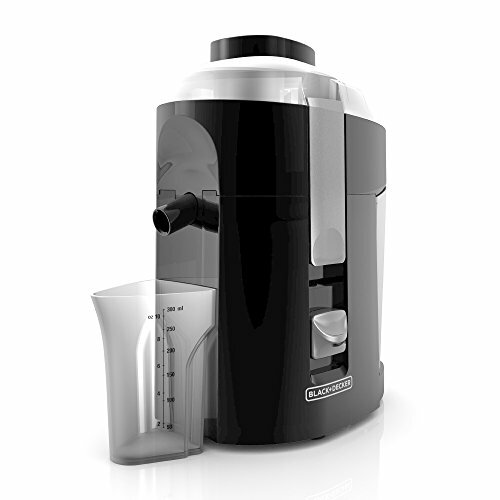 The juicer has an intuitive On-Off switch which lets you control the operation easily. You’ll find this juicer very user-friendly while using. The Black and Decker JE2200B comes with a 400 watt powerful motor which can easily extract the nutrition from the fruit and vegetable very effectively in a moment. You’ll get pulp-free juice from all the fruits even if you try the toughest fruit! The powerful motor will show up its power by doing its job fast. The cutter and strainer are made with stainless steel which do their job very smoothly and last longer. Some juice extractor is very hard to be washed properly. But don’t worry; this B&D JE2200B offers you an easy cleaning feature. You can wash the juice extractor in the dishwater easily. Just remove the removable parts of the juicer and wash them in the dishwater. In addition, you can wash up the juice extractor really quick! Do you know which is the important part of a product? Yes, the look! And in this section, this juice will pass without any doubt. The compact design and the awesome look have made the juice more attractive. Additionally, the compact design will help you to save more space in your kitchen. The dimension of the juicer is just 13x9x9 inches and you can place it anywhere you want. And the built-in cord storage makes the juice extractor prettier. You can hide the cord inside the cord storage when it is not in use. 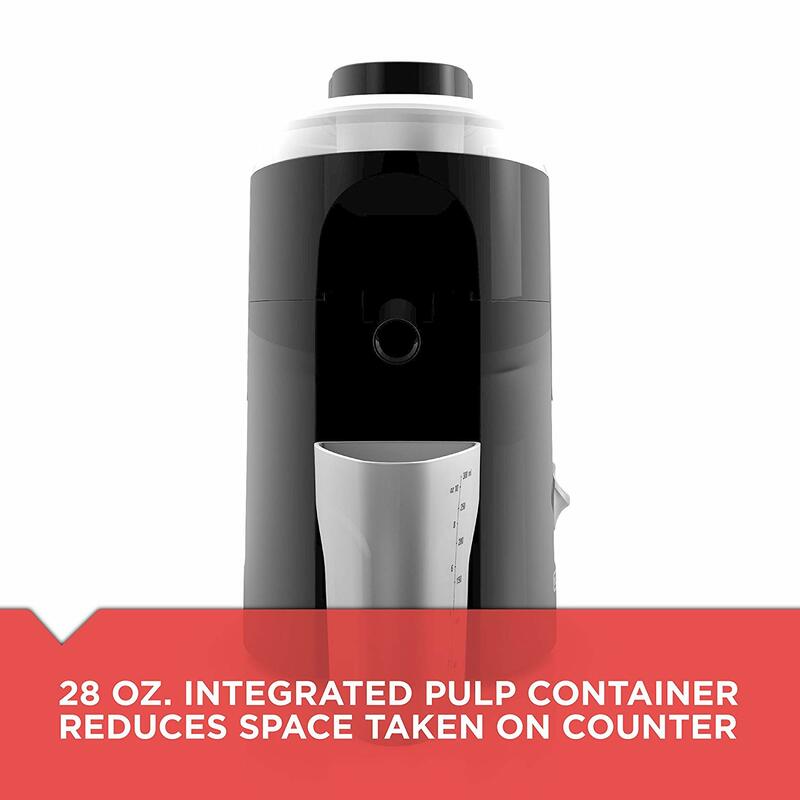 This juice extractor comes with included 28-ounce pulp collector in order to manage the pulp you’d like to have in your juice. Basically, it’s a great addition because different person likes different amount of pulp. Additionally, the 300 mm juice pitcher collects the pour juice for you and with the pitcher; you can easily measure the juice. This Black and Decker JE2200B has included safety feature so you can be worry-free. You don’t need to be worried when you make the juice. Just chill.Bad Sides:Not a single product is perfect. As usual, this product also has some weak or bad sides along with those great features. This juice extractor is a little bit noisy than standard. So you may feel very uneasy in the morning especially when you’re in a peaceful sleep. But be positive, it can also work as an alarm clock and makes you awake if you can’t wake up timely; hahaha! Besides, this unit isn’t BPA free and becomes a little bit hot. Another disadvantage is that the juice extractor isn’t perfect for all kinds of vegetables especially when you need to juice green leafy vegetables. Additionally, the juicer comes with a small feed chute so you may not find it useful when you need to juice more at the same time. Great vegetables and fruits pusher at affordable price. This juicer has a small feed chute so not recommended if you need to juice more at the same time. Answer: It can do but not good as the other wheatgress juicers , if you want to do 80% times of your juicer for wheatgress then try this Best Wheatgrass Juicer Reviews. Question: Can I juice all kinds of fruits with this juicer? Answer: Yes. You can juice almost all kinds of fruits conveniently with the juicer. Don’t worry about it. Just get one and enjoy! Question: Will it be suitable for the beginners? Answer: Yep, this machine is suitable for all kinds of people. Starters can also operate the juicer effectively because of its easy to use feature. Question: How can I wash the juice extractor? Answer: You can simply wash the removable parts of the juicer in the dishwater easily and quickly. So? At the bottom of the review of Black and Decker JE2200B fruit and vegetable juice extractor, what do you think about it? Is it really perfect for your home or it needs more improvement? Though it’s not possible to tell about a product without using that, but we assume you’ll be able to know the product by this review if you have user experience with any kind of juice extractor. Basically, this product is simply pretty awesome and we hope that you’ll find this juicer helpful and user-friendly as because it comes to satisfy its users by extracting the maximum nutrition from the fruits and vegetables.